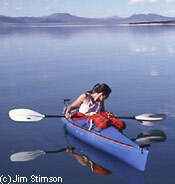 A great way to enjoy the Sierras is floating and paddling through some of the peaceful lakes of Mono or Crowley Lake. Or experience the incredible calm of the high alpine waters canoeing or kayaking in one of the many lakes nestled in the Eastern Sierra. There are lots of freshwater lakes that offer delightful locations to paddle kayaks and canoes. You can paddle your boat to a secluded beach and enjoy a picnic in the sand. Crowley Lake is a large freshwater lake close to Mammoth Lakes with spectacular scenery of the surrounding Sierra Nevada peaks. Rentals are available from Caldera Kayak right at the Crowley Marina from May to October. Guided tours are also available so you won't race by a scenic gem overlooked by many paddlers. Or you can paddle a kayak along the twenty-mile shoreline and discover hidden coves and sandy beaches for yourself. Grant Lake, a reservoir upstream from Mono Lake, has lots of sandy beaches and great vistas of Mt. Wood. Trees line the shoreline and the water is refreshing on a hot day. Autumn colors are especially vibrant on the lakeshore and hills that surround the lake. Grant Lake is part of the watershed that fills Mono Lake and the lake is quite full these days. You can also paddle through Mono Lake, but must be extra cautious of the tufa towers. Paddle a kayak through the tufa towers and experience the strange and fascinating ecosystem that makes the lake unique. Mono Lake is the birth place of eighty five percent of the California gull species within California, home to the brine shrimp, alkali flies, and is an essential feeding layover for numerous species of migratory birds. 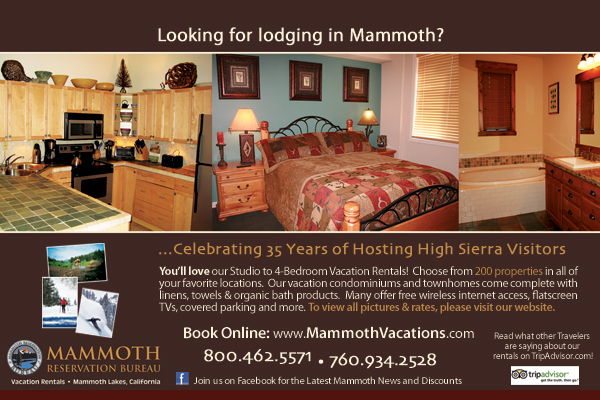 For information on boat rentals, check out the Mammoth Marinas section. The marinas will have the most up to the minute infromation on who has boats and availability.